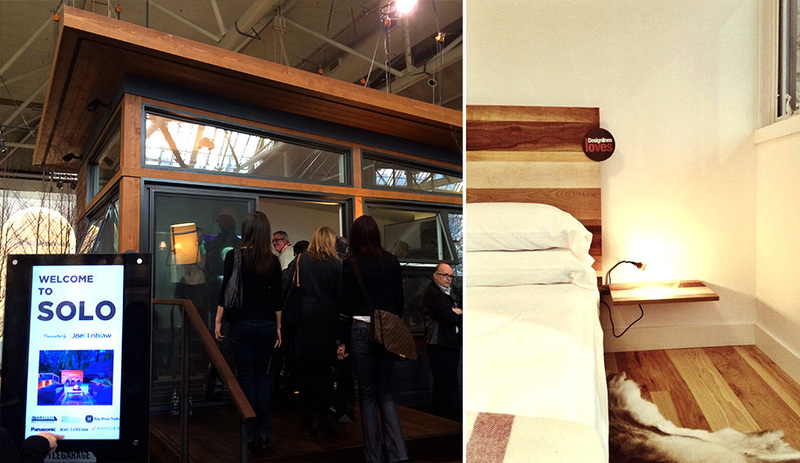 After an exhilarating weekend exploring the Interior Design Show and the dozens of off-site happenings around the city, we’ve gathered our snapshots of the 20+ products, events and designers we saw and loved. Azure’s annual Trade Talks series featured an Italian tour de force – Patrizia Moroso – who was visiting Toronto for the first time. 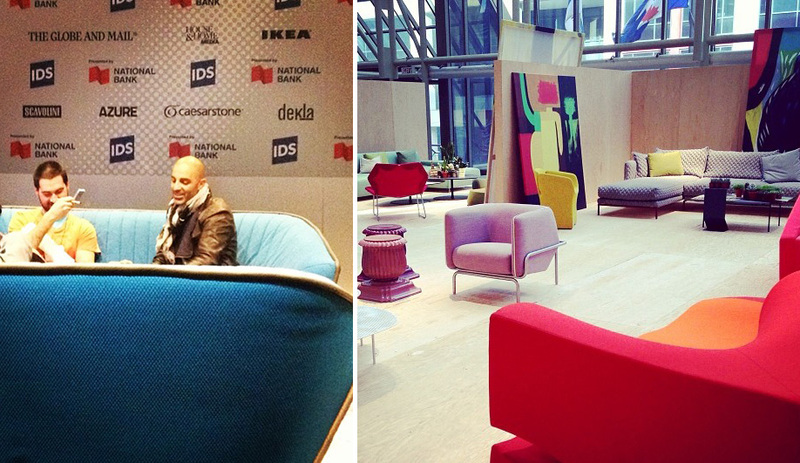 Her company’s furnishings were also on display as part of a Moroso lounge (above right) furnished by Klaus. New York’s Dror Benshetrit of Studio Dror (seen at left in the VIP lounge) also spoke about his diverse practice, while Dennis Askins, creative director of Diesel’s Successful Living took the stage to describe how fashion and furnishings go hand in hand. One of the most eye-catching exhibits at IDS was a collaborative effort between Caesarstone and London studio Raw-Edges. 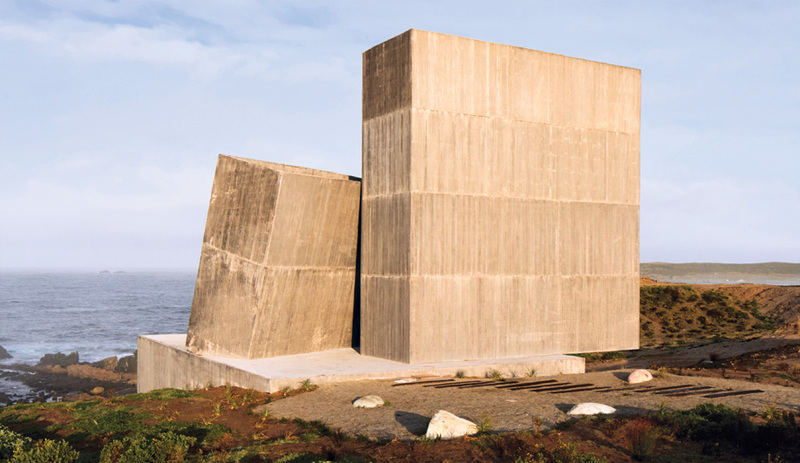 They presented a series of islands inspired by various home environments and made out of Caesarstone’s quartz-based solid surfacing. 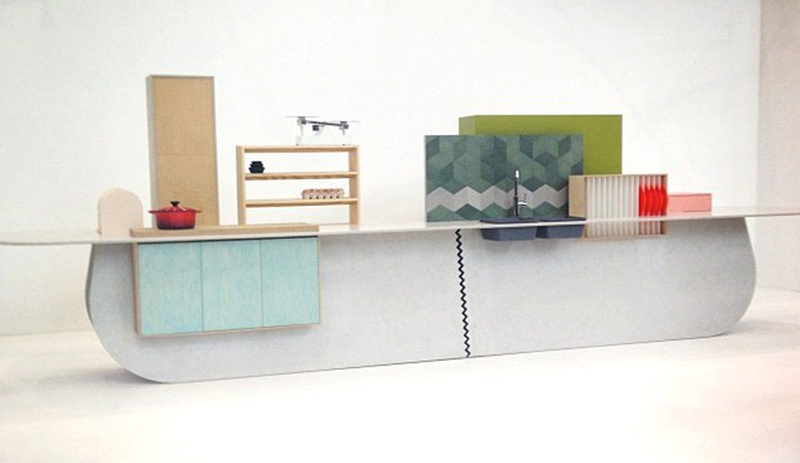 The kitchen island (pictured above) is comprised of wooden cabinets inserted in apertures cut into the base and countertop, which fit together to form a base. Bath settings and ping pong tables were also on display – showing off both the manufactured stone’s versatility and Raw-Edges’ limitless imagination. At Studio North, where young talents are invited to show their latest pieces, Tony Koukos (left) reincarnated his globetrotting photography into rich patterns for rugs, lampshades and wall coverings; and Christopher Solar (right) presented a finely tailored collection of loungers and rocking chairs upholstered in Kvadrat wool. 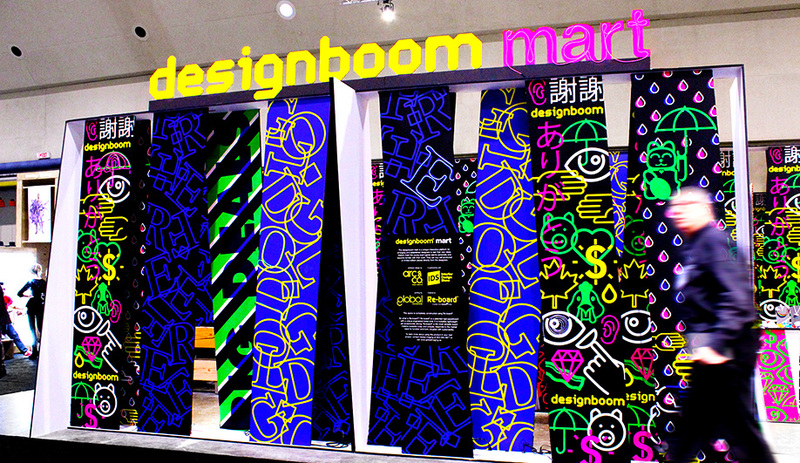 4 IDS: Designboom Mart by Arc & Co. 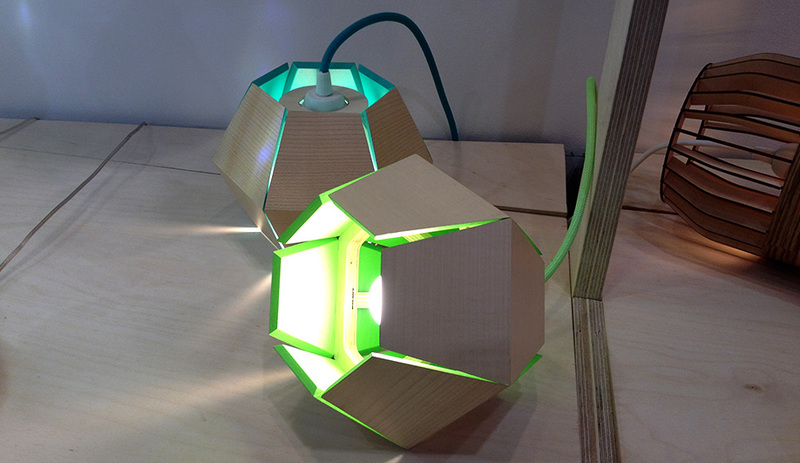 The popular, and traveling, design bazaar returned to IDS for a second year, as did its IDS exhibit designer Arc & Co. Using a black-market-meets-Harajuku-neon theme, the Toronto firm covered slatting with overlapping wall panels in bold graphics and multicoloured electro-luminescent wires. The vibrant display acted as a backdrop for 18 upcoming talents selling their limited-run wares, including jewelry, space-age reading glasses and waterproof boat blankets. 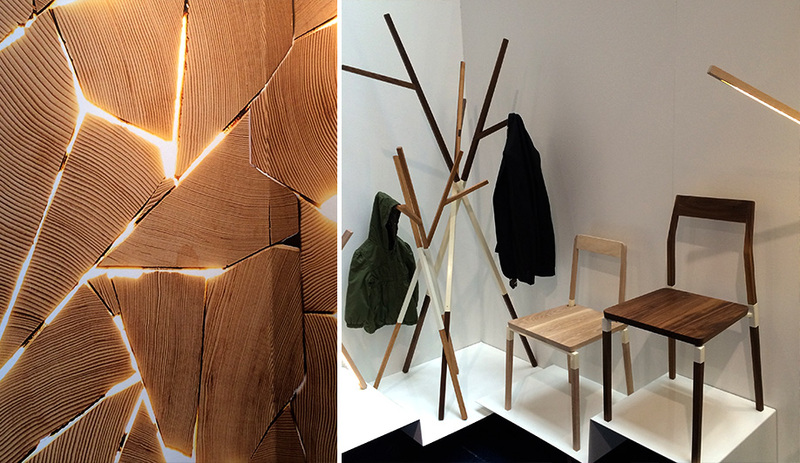 If anybody understands the language of wood it’s Vancouver designer Brent Comber, who crafts furniture from bits of timber that appear to fit together like puzzle pieces; now his signature cutouts have been adapted by Toronto manufacturer Rollout into a cabin-inspired custom wallpaper (left). Furthering the wood theme, emerging local firm Hollis+Morris showcased a pared-down collection of stick-like seating and racks held together by powder-coated steel brackets. Vibrant hues popped up around the show floor. Porcelain tile company Ceragres displayed boldly coloured Mix ‘N’ Match pieces from Italy’s Gamma Due (left) that appeared to take cues from the whimsical drawings of Spanish illustrator/artist Javier Mariscal. 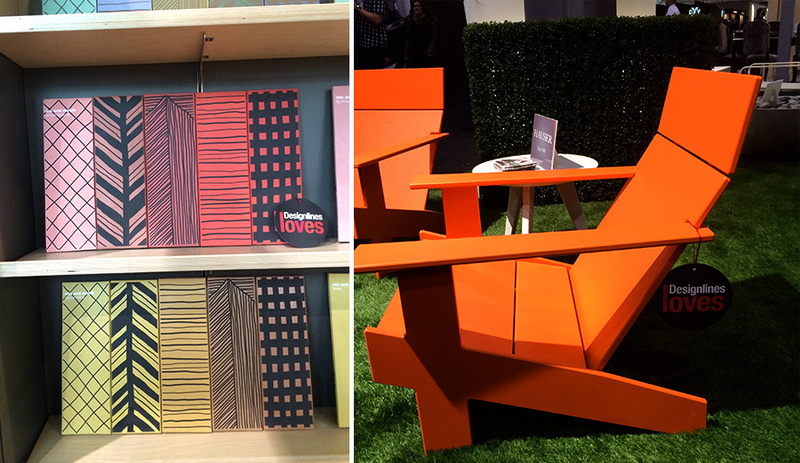 Over at Hauser, the ubiquitous Adirondack chair was transformed into the Lollygagger, with back slats that run horizontally and a coat of paint in saturated orange. 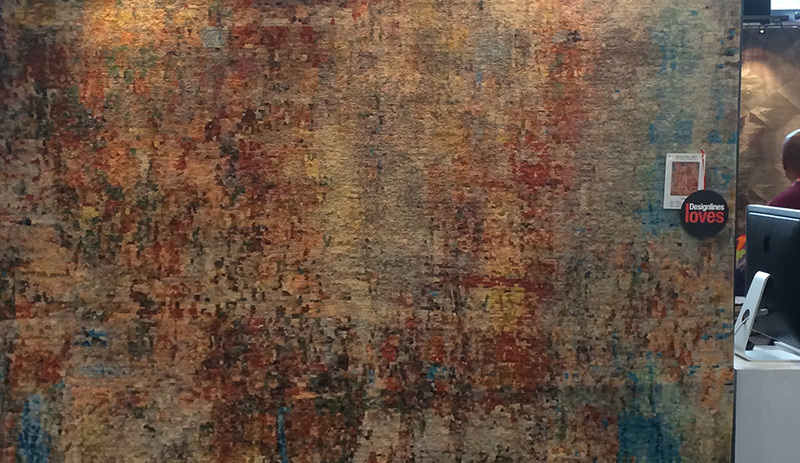 Whether this wool rug recalls impressionist paintings, weathered steel, or a blur of futuristic pixels, there is no denying it was a stunner. Soho comes in five standard sizes. 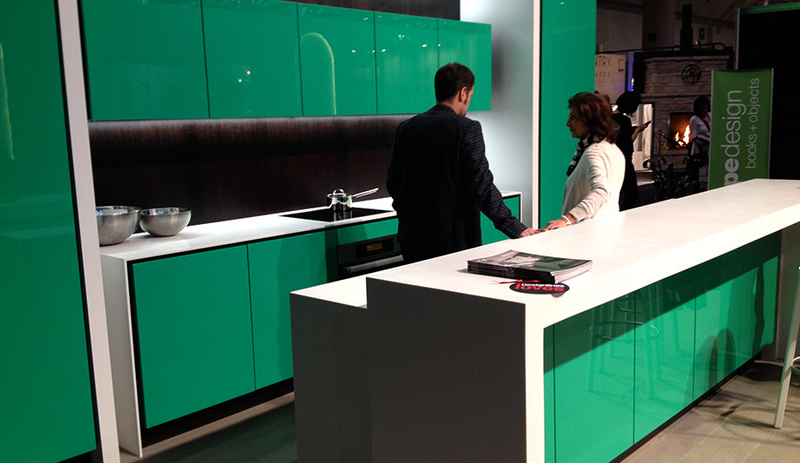 Dror Benshetrit has struck green with the new Avani line for Aya Kitchens. Named Arc, the ultra-contemporary system is defined by its emphasis on symmetry, and by its sleek finishes: hardware-free lacquered doors and Corian countertops, and hand-rubbed, rift-cut white oak cabinetry. Space-saving features include sliding islands and cooktop covers, hidden appliance garages and a swivel table. The Montreal outdoor furniture manufacturer cleverly upcycles the offcuts of their patio umbrellas into durable and water-resistant handbags, purses and satchels. The small pouches pictured here can be used as purses, or as bags for potted herbs that clip onto railings or hang from nails. Born in Paris and based in Montreal, Loïc Bard conveyed his superior skills as a woodworker in this delicate pendant light, named Capside, which can be hung or left on a table like a cut flower. Each year a group of local female designers collaborate on an exhibition under a given theme. This year, the source of inspiration was Ray Eames, who, with her husband, Charles, revolutionized 20th century household aesthetics. 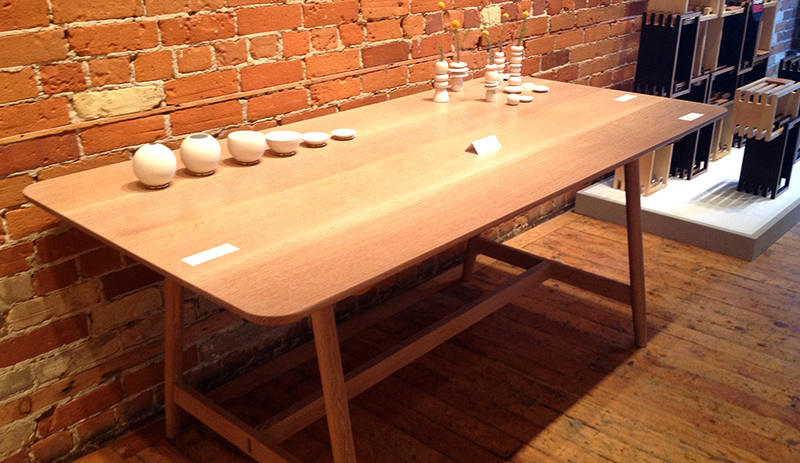 Heidi Earnshaw embraced her mentor’s ability to blend function and beauty with her Bloordale Breakfast Table made out of quarter-sawn white oak. The rounded edges give the piece a certain whimsy that was also a big part of the Eames legacy. The Gladstone Hotel’s annual art-design show Come Up to My Room (CUTMR) invites local talents to fill rooms and hallways with installations. 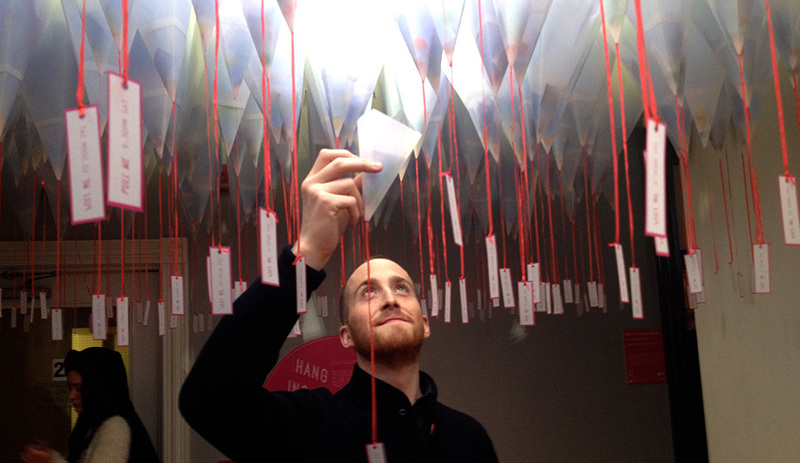 Jordan Evans, Ryla Jakelski and Evan Jerry, all students at Ryerson’s School of Interior Design, crafted hundreds of conical forms out of paper, and hung each in stalagmite-formation from the ceiling. At given times, show goers were invited to pull on dangling tags, releasing candies and condoms hidden inside. Also as part of Come Up to My Room, the collective A Zero (AO) wrapped one of the Gladstone spaces in upholstery padding and hung hair-like strands from the ceiling (left). A stool at the centre of the cocoon-like space invited individual guests to immerse themselves among the strands and be soothed by shifting music and LED lights – and forget about the frigid temperatures outside. 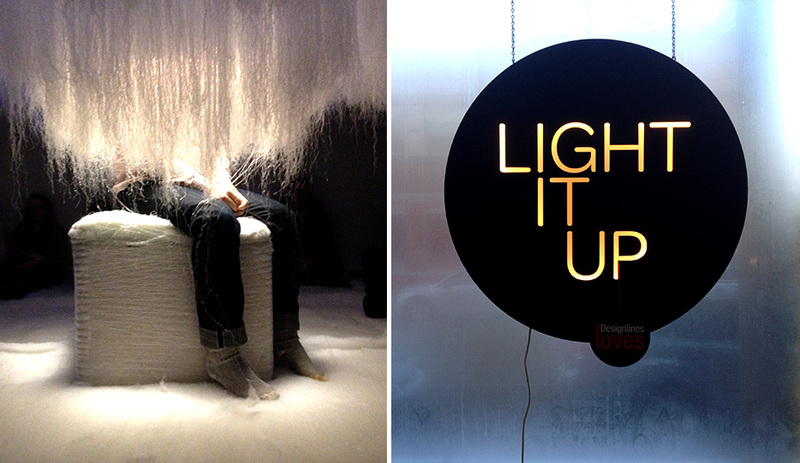 Another off-site exhibition, Light It Up (right) brought together a stunning display of pendants and floor lights custom made by 12 local designers. 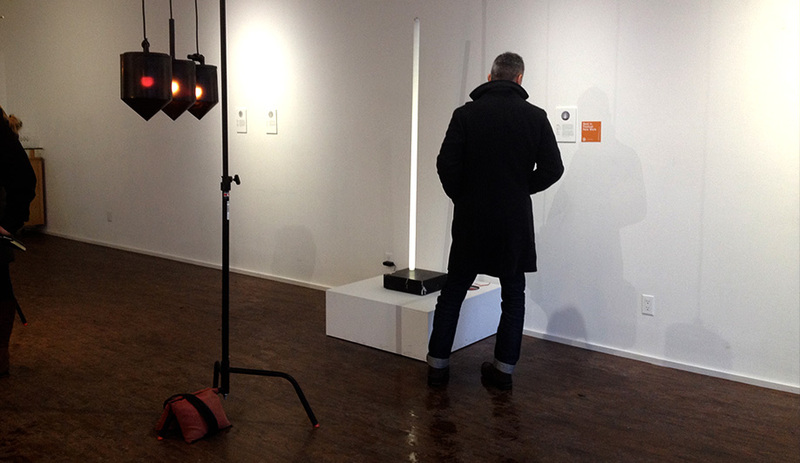 Brian Richer’s sculptural floor light was among the custom fixtures fabricated for the off-site exhibit Light It Up. 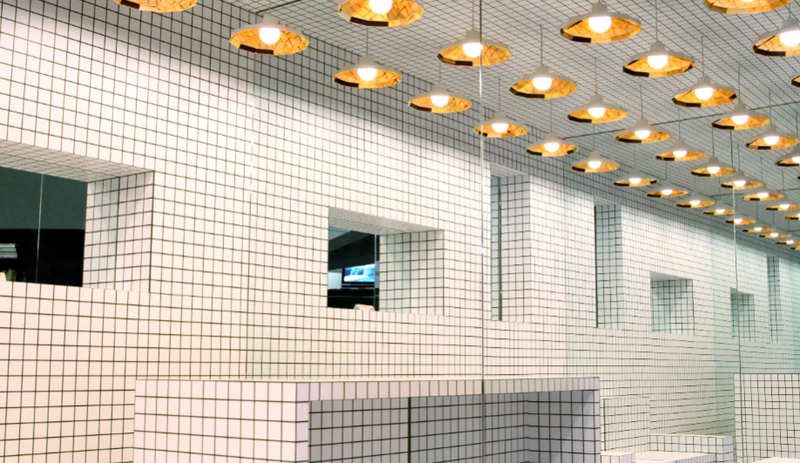 Richer is part of Castor Design, which made its name crafting pendants out of burnt bulbs and fluorescent tubes. Here, a working fluorescent bulb is embedded into a black marble base, which invisibly houses an electrical current within a magnetic field. 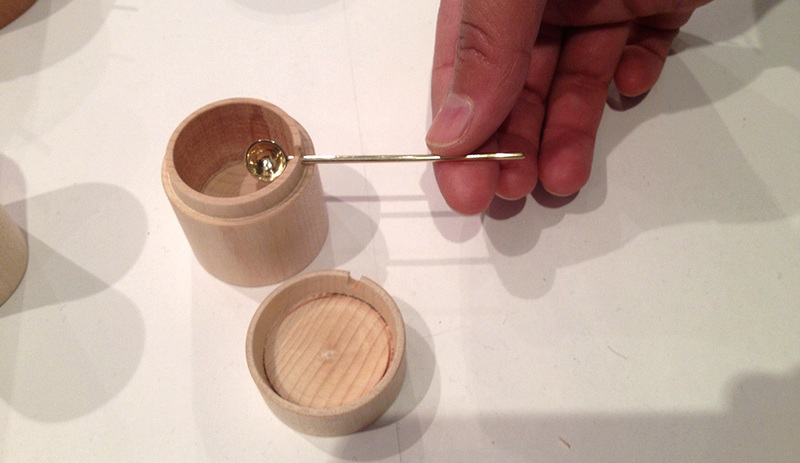 Anneke van Bommel’s Solid Wood Salt Cellars & Floral Tea Strainer were on view at Not Forkchops, a tabletop exhibition featuring home accessories and sponsored by IMM Living. 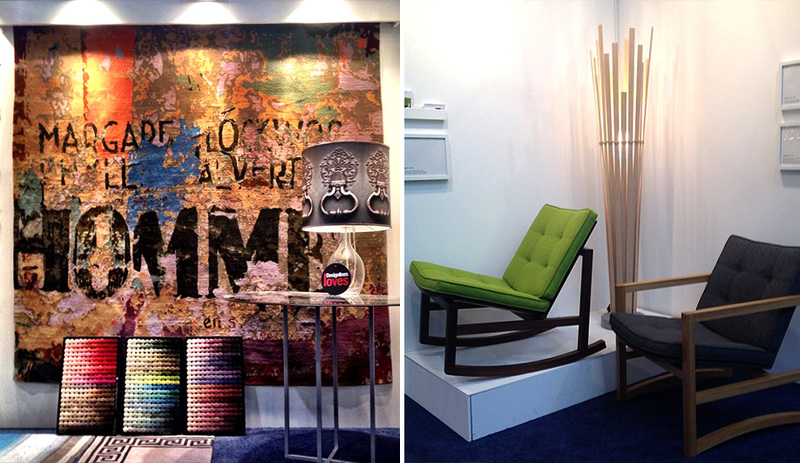 Viewers were invited to vote on their favourite piece, and the design with the most votes would be produced by IMM. In the end there was a tie: Van Bommel’s miniature set and Grace Eun Mi Lee’s Eye Popping Salt & Pepper Shakers equally pleased the crowds. 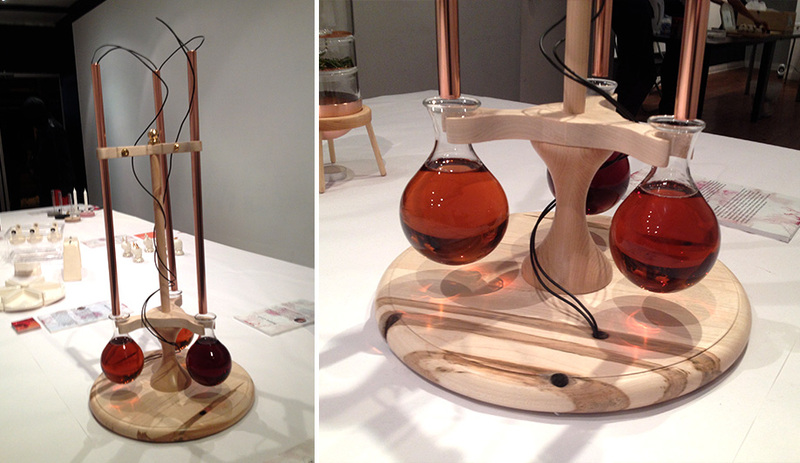 Design studio South Street Boat Builders, run by Hilary Hayes and Tim Richards, crafted an elaborate maple syrup dispenser to give the act of pouring syrup a sense of occasion. 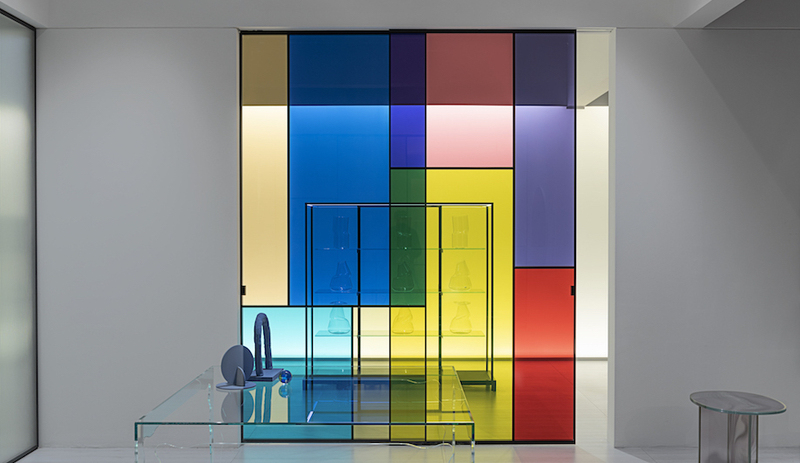 The Acernis Luminata consists of glass vessels designed to capture the viscosity and colours of different varieties. 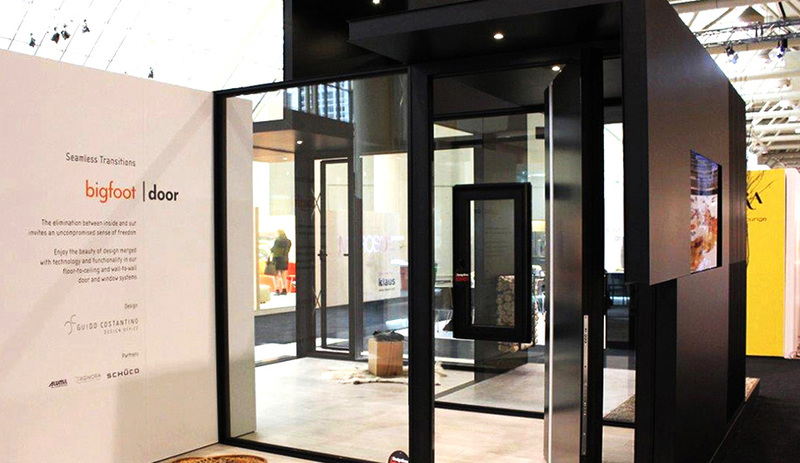 At IDS, Bigfoot Doors showcased its sleek aluminum windows and entrances by local designer Guido Constantino. The booth evoked a Canadiana feel with the addition of snowshoes, old skates and birch tree logs. 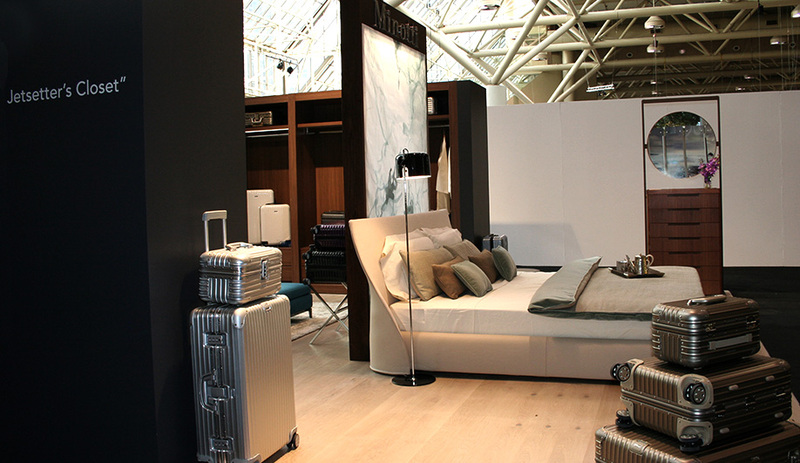 Rimowa and Interior Elements partnered with Toronto’s Chapi Chapo Design for this dreamy display catered to travel junkies. The Altea bed and Yang dresser shown are by Italy’s Giorgetti (with other pieces from Minotti), while Pianca supplied the luxe closet system. Ian Murchison and Rohan Thakar, the Ottawa duo behind The Federal, showed off a number of new items at Studio North, including a flexible rubber bike stand and their maple knives (the latter, which we featured in our profile of the studio, are in search of a daring, and design-minded manufacturer). 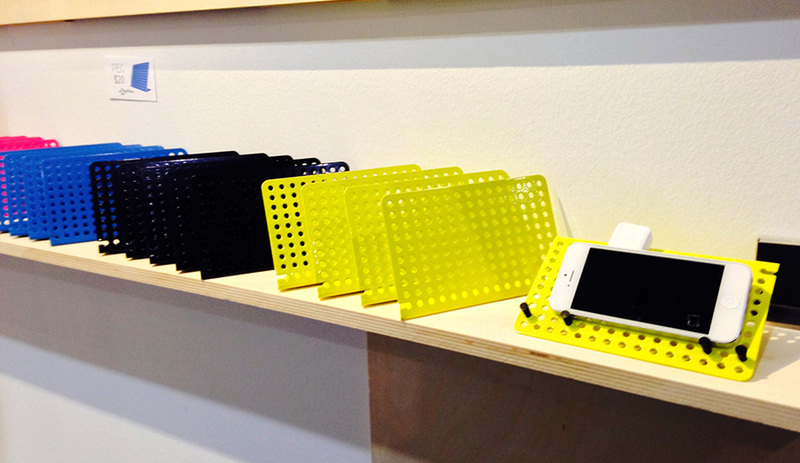 They also displayed this iPhone hub, called Peg, which was successfully funded through Kickstarter and comes in eye-popping hues. New York designer Martin O’Flynn showed off this elegant number at Studio North. 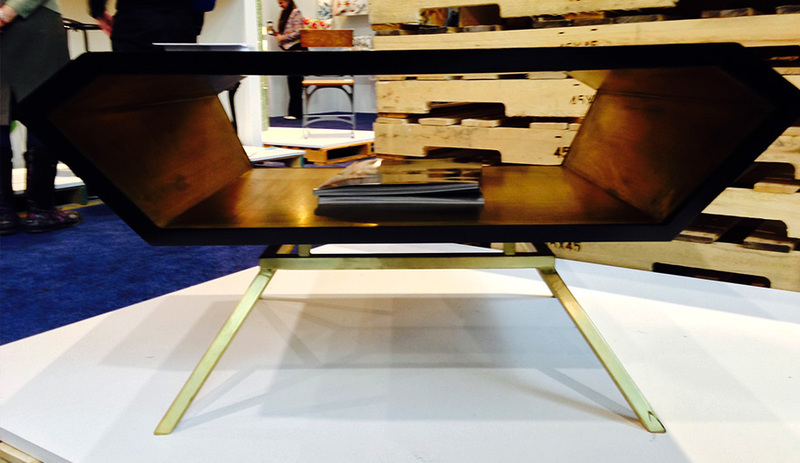 The Bevel occasional table is made of wood but is lined with brass and sits on a brass base. The finish creates the effect of an interior glow, minus the mechanics. 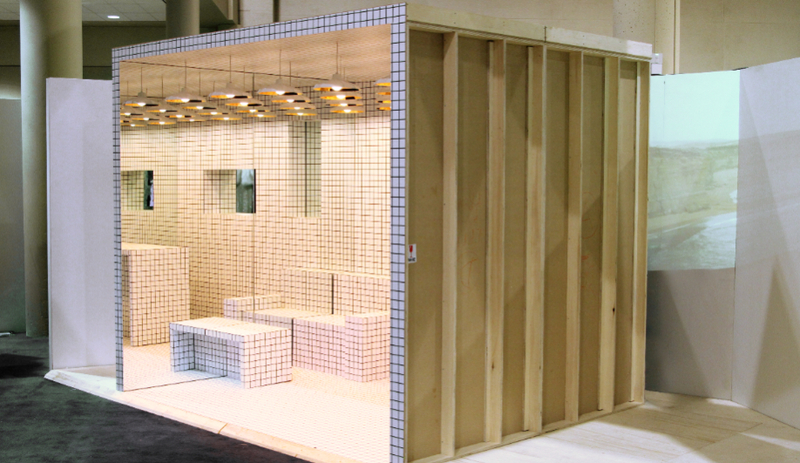 The monochromic interior of Jessica Nakanishi and Jonathan Sabine’s installation for this year’s IDS trends space See the Light paid homage to Superstudio’s 1969 Continuous Monument. Foscarini supplied the glam Mysterio pendant by Diesel for Foscarini. 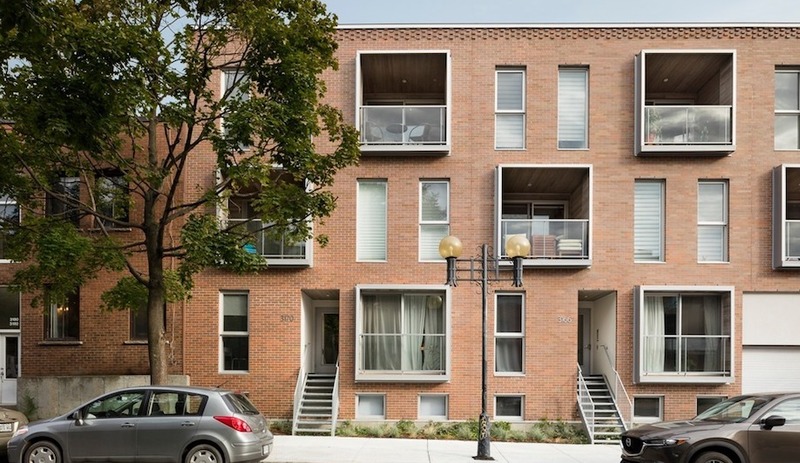 21 IDS: Solo Home by Altius Architects Inc.
Everyone loves a tiny house, and Altius Architects has been building modular prefab homes for a while now. Solo 40 is its latest. At 480 square feet, the mini-home contains a kitchen, a living room and a washroom and features a tiny porch; it retails for $195 per square foot. The IDS model was smartly kitted out with furnishings from Gus* Modern designs.